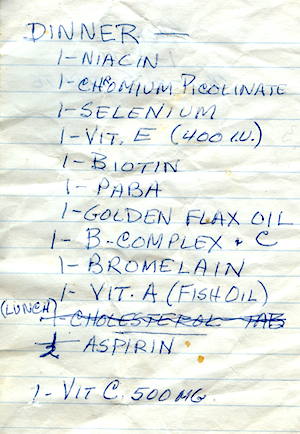 I was checking out pockets of the luggage I’d bought from the Salvation Army, and inside were three pieces of memo paper with a list of supplements to be taken with “Lunch,” and “Dinner.” Found inside of a plastic baggy. The suitcase had a greyhound ID badge with the man’s name, address, and phone number. I looked him up online and appears that he just recently passed.